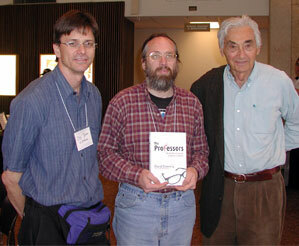 David Horowitz features Marc Becker (pdf file) in his book The Professors: The 101 Most Dangerous Academics in America. This piece is edited from an entry on Marc Becker that was originally featured on his discoverthenetworks.org. Robert Jensen's "Dangerous" Academics: Right-wing Distortions About Leftist Professors is a good response to Horowitz's charges. For my take on the issue, see my essay for my nomination for Truman's 2006 Educator of the Year award. Jon Lawinger wrote Truman professor Marc Becker featured in book of “most dangerous” for the Truman State University campus collective newspaper The Monitor. I am also quoted in New book targets 'dangerous' academes. Also see Broad Coalition Decries Blacklist of Professors and Efforts to limit Free Speech on Campus from Free Exchange on Campus (in particular, see their report "Facts Count: An Analysis of David Horowitz's The Professors"). Horowitz later called me an "obscure professor." Real danger is Horowitz's lack of research behind "The Professors"
And an inclusion in an interview with President Barbara Dixon, President Dixon steps to the mic. Here are some reactions from my students.